The HTC One Mini 2 was announced in May 2014, and was available in the market right away. The official specifications of the device include – a 4.5-inch Super LCD2 720p HD display, 1.2 GHz Quad-core Qualcomm Snapdragon 400 processor with 1GB RAM, 16GB internal storage, Adreno 305 GPU, 13-megapixel camera with LED flash, 5-megapixel front facing camera and a 2110 mAh battery. The mini versions of flagship devices, as we recently mentioned the same while talking about the Samsung Galaxy S5 mini, have become a part of the major plans from the brands which bring out the basic versions of the device with smaller screens and mid-range specs, and that is the case with HTC too, which is soon going to announce the mini version of the HTC One M8, the company’s flagship device for this year. According to the several rumors around, the mini version is going to be called HTC One Mini 2 instead of the HTC One M8 mini, but that’s not something confirmed. One of the most interesting details about the HTC One M8 was the Duo camera where one could use two cameras located on the rear panel of the phone, but the mini version of it won’t have this dual camera combination. Again, HTC isn’t giving even the UltraPixel camera on the rear side in the shrunk version, because according to the sources, the Taiwanese company is going to put in a 13MP camera on the rear side of the HTC One mini 2. The second lens provided in the One M8 was to change the focus on the picture which is already processed (something like the Lytro camera, but not with that much flexibility) and one could easily change the focus or add any blur images to an already captured photograph, making it better for post-production. All this would be exclusive only to the original M8 and not to its mini edition, although one could easily use the Google camera app if they wanted to add the blur to the photos. From what the rumors claim, we learn that the HTC One mini 2 might have specs similar to that of the Samsung Galaxy S5 mini, where the processor included is the Snapdragon 400 chipset, a quad-core one clocking at 1.4 GHz, and there is a 4.5-inch display having a 720p HD resolution on the top of it. 1GB RAM and 16GB internal storage are expected, along with the Android 4.4 KitKat having the HTC Sense 6 UI, out of the box. When the specs are still being rumored, it’s obvious that HTC isn’t in any hurry to announce the phone, as nothing is being officially mentioned by the company. But the prominent leak source Evleaks says that the phone might be an exclusive with the Verizon network, but we expect it to be available with all the major carriers, and as an unlocked device as well. Let’s wait for the official announcement and unveiling of this, and see if HTC is going to price this at a competitive range compared to the S5 mini from Samsung, or decides to surprise with something special packed in. Having used the actual flagship devices and their mini versions in the past, we can assure you this is not something good as most of stuff here is compromised and you just would get a feel of the flagship phone because of the name, that’s it! 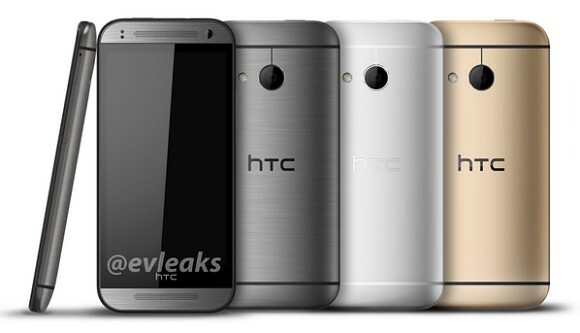 Update: Although HTC might be trying to keep this phone completely hidden for now, there are leaks, and some solid real photos of the HTC One mini 2 which show different color options, the Gray, silver and gold colors which look pretty cool and these photos yet again confirm that the mini is not coming with the Duo camera on the back.